Call us today on 0800 9803473 or click here for a free quote! 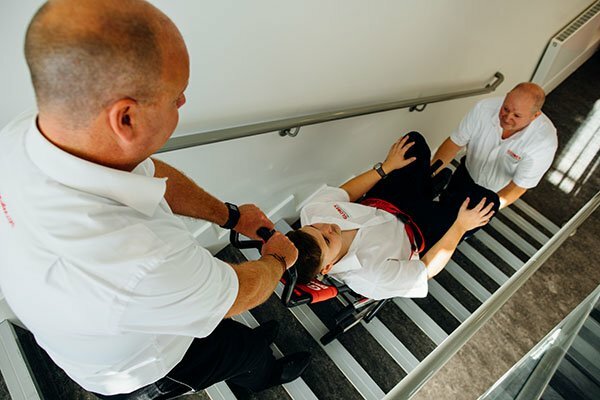 Our certficiated training courses are tailored to your needs, and provide your staff with the necessary knowledge to attain the level of proficiency and confidence required to safely evacuate the physically impaired in an emergency evacuation. We offer both Train A Trainer & Train An Operator services which ensure that you meet your legal obligations, and as part of our five year compliance plan, will keep your workplace PUWER compliant. PUWER requires that equipment provided for work is safe for use, maintained in a safe condition and inspected to ensure it is correctly installed and does not subsequently deterioriate. 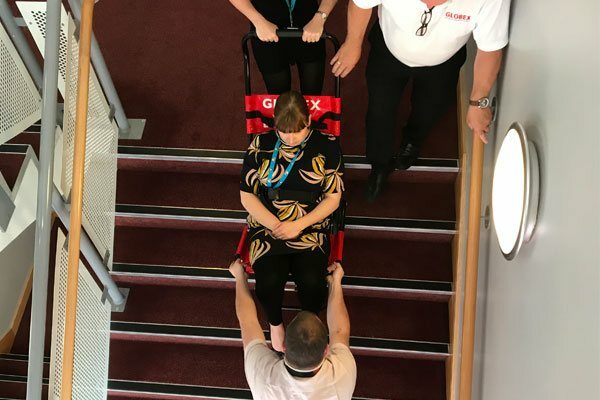 Our specialists follow a rigirous 31 point checklist when carrying out maintenance on your GLOBEX Evacuation Chairs, and any work that needs to be done to them is carried out on site. Train to be an evacuation chair trainer with our evacuation chair Train The Trainer course. This ½ day course will equip staff with the ability to train others on the safe use of evacuation chairs. A practical approach is taken to ensure plenty of hands-on practice with regard to both the practical element and the training issues — all under expert supervision. Will equip your people with the competency to conduct in-house evacuation chair training. Generates cost savings through bringing skills in-house. We can train on most types of evacuation chairs. Delivered by a highly experienced instructor. Ability to understand how to safely use evacuation chairs. Be able to conduct appropriate training to other members of staff on evacuation chair usage. Train your staff on the safe and competent usage of evacuation chairs with our Train An Operator course. This ½ day in-house course will equip staff with the ability to safely use evacuation chairs. The course covers the deployment and handling of an evacuation chair and passenger. It will also cover advice on the siting and distribution of chairs as well as improving awareness of their multiple uses. A practical approach is taken to ensure that plenty of hands-on practice – all under expert supervision. Will equip your people with the competency to safely use evacuation chairs. Practical and interactive to maximise the effectiveness of the training session. Be able to demonstrate the practical skills required for safe evacuation chair usage. The Provision and Use of Work Equipment Regulations 1998 (PUWER) requires those who own, operate or have control over work equipment to ensure that it is suitable for its intended use, safe for use, and is maintained in a safe condition. In addition to this, PUWER demands that those who are operating the equipment have recieved adequate information, instruction and training. This responsibility extends to businesses and organisations whose employees use work equipment, whether owned by them or not. We offer a variety of services in the form of of certificated operator training, trainer training and annual maintenance. Our five year compliance plan guarantees that your GLOBEX Evacuation Chairs are covered for the life of their warranty under PUWER with no additional expense. The GLOBEX five year compliance plan can be purchased at any point up until the first annual service of your chairs. This one off inflation proof payment not only offers peace of mind but the are also transferrable to new staff members that need to be trained. The GLOBEX five year compliance plan includes the annual service of GLOBEX Evacuation chairs and annual refresher training for accredited GLOBEX Evacuation Chair staff. © GLOBEX EVACUATION LIMITED - SITE BY ELFRA DEVELOPMENT LTD.